Both of these sites are quite extraordinary collections of images of New York, one focusing on the now, the daily, the quotidian delight of looking at the city; the other on the history of the city, its hidden past, the delight of discovering memories. A reminder that "New York exists as many times as many times as there are New Yorkers." "This is a Brooklyn-based photolog with an emphasis on strange signage, urban decay, and general weirdness." "The infrastructure of a lost metropolis: The past is all around us in New York. It's on the buildings high above and in the subways and tunnels deep below. It's even in the paths the streets take. This site is your gateway to a New York City that existed long ago -- and still exists in a hidden form today. On this site we'll show you remnants of a NYC of long ago, as well as unusual scenes not ordinarily associated with New York." Beware. Approach with caution. This is, without doubt, the worst coffee in the world. I bought this from a supermarket in London's Arabian wonderland off Edgeware Road because I liked the packaging. I'm afraid it's grotesque. I threw the whole packet away after one cup. I knew Lebanese Brazilian was never going to be the greatest coffee, but I wasn't prepared for quite how disgusting it was. It tasted like fish. 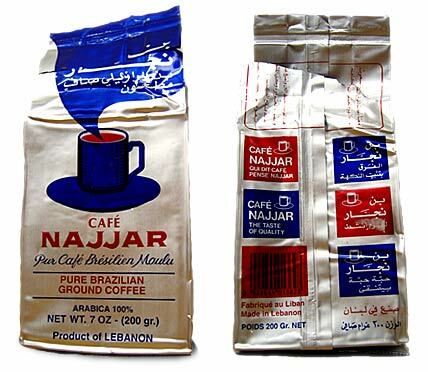 Still, the packet was nice - I like the panels on the back, mirroring arabic and English script (so both read from the outside in) and the arabic script in the blue 'steam' on the front. Any other designers been suckered into buying something this genuinely awful, if not life-threatening, by packaging-attraction? Matt Jones mailed me last night about a bootleg/mashup over at boomselection (the Jan 18 entry): Raiding the 20th Century, by DJ Food's Strictly Kev [mp3]. It's unbelievable. Check the tracklisting (labelled as the DJ Food mix). Not just the usual Xtinas and Beyoncé's stretched over rock beats (tho there is that), but also the forerunners of cutup: John Oswald, Steve Reich, William Burroughs, Pierre Henry, Grandmaster Flash, Tape Beatles, Negativland, Christian Marclay, Black Helicopters etc. More thoughts to follow. Get it while it's hot. Singles-wise, everybody loves Beyoncé's Crazy In Love and Outkast's Hey Ya! right?, Yo La Tengo's Nuclear War was a great cobweb-blower-outer, Bowie's New Killer Star was surprisingly good, any Homelife or Mice Parade EPs are worth mentioning, and Koushik's One In A Day single was great too. Oh, and I still feel that the bootleg scene has blown itself out, but the work of Go Home Productions is fun [via S/FJ]. Stuff from previous years I ended up listening to a lot: Themselves' The No Music; Ella Fitzgerald's Cole Porter Songbook, and Michael Gallasso's soundtrack to In The Mood For Love. But on the reissue front, nothing comes close to Television's Marquee Moon. Best Design award goes to the usual suspects: Tzadik, Hat Hut, Revenant, ECM, and Rune Grammofon - particularly having had a look at the latter's new release, which is a beautiful book. Looking at 2002's list it looks OK, but perhaps suffers a little in comparison? Still, every year produces extraordinary music and I'm still listening to insane amounts of it. How nice. "I enjoy the city sounds of early morning, especially when the foghorns are in the mix. By the time it's light out the mystery is gone, but while it's still dark or just beginning to turn, the sounds are muffled and tend to bleed into one another. It's as if a jar had been placed on top of the world." "The garbage trucks, the streetcars, the buses gearing up and down. … I'm especially partial to the sound of large passenger jets muted by night, or rain, or cloud. When I'm on the East Coast in the winter and it's snowing, or getting ready to, the airplanes overhead have a very particular sound that always affects me. There's quite a range of pitches out there, a range of tones: When one noise comes in over another and then another and another, it gets positively fuguelike—a broken-up, post-industrial version—but fuguelike nevertheless. And when you have the foghorns sitting in, my goodness gracious, you're in for some listening pleasure." "Composers and musicians pay close attention to all these random sounds, all these accidents of harmony, dissonance, and counterpoint, as they go about their day. When you're hanging with one of them, an alert one, you see the head jerk slightly, the eyes dart around and narrow in concentration at an interesting vibration. A prose writer soaks up random language and registers striking or unusual syntax, slang, unfamiliar locutions. A poet—at least this one—occupies a sound-world somewhere between, encroaching on both." "We don't often get the foghorn music in this part of town, particularly this time of year. In the summer it's not uncommon, but in January it's rare. So, when it's out there, like this morning, however faintly, it's a treat. In fact, foghorns are one of the principal reasons I don't live in Cincinnati." 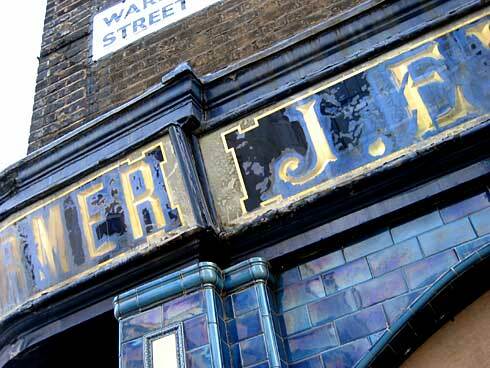 I've collected a few collections of signs and lettering (fascia, architectural, public etc.) together before (here, here, and here), but this collection at No Relevance, by the aptly named Art, is utterly beautiful. "Living in New York City, it's easy to come across some fine examples of hand made signage amidst the suffocating cacophony of computer-generated lettering and imagery. These works might be buried in between some large four-color billboards in midtown or on the store awnings of a soon-to-be-discovered Lower East Side street. They might also be as simple as the words 'free delivery' painted onto the plate glass window of a pizza parlor. 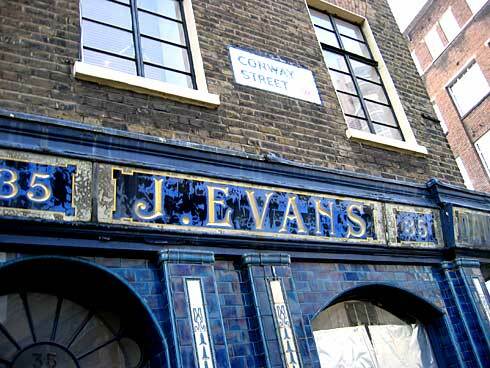 They are remnants of a not-so-bygone era when craftsmen and tradesmen created and built things by hand ... I hope this collection of signs, photographed in New York City, New Orleans, Pennsylvania, and Massachusetts, pays proper homage to the artists and craftsmen who created them." 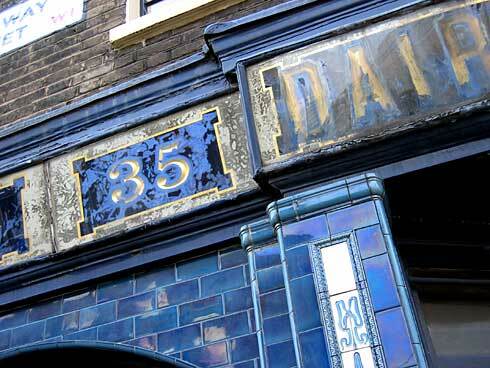 In Phil Baines and Catherine Dixon's excellent book, Signs: Lettering In the Environment [Amazon UK|US], the authors note the disappearance of hand-made and high-quality manufactured fascia signage in the UK. "Only one of the twelve examples on this spread is from Britain, a country whose high streets have been blighted by chain stores with their corporate, one-size-fits-all approach to shopfront design. The remainder are from France, Portugal and Spain, countries where small businesses really know about letters, rather than simply knowing how to connect a computer to a vinyl cutting lathe." As the authors make clear, signs don't all have to be hand-painted as in No Relevance's brilliant collection, but do require an appreciation of letters, or at least the importance of a sign with impact, character, grace, verve - some indication of humanity. There are still examples around in British cities, but you have to look much harder than you do in Paris, say, or Barcelona, Milan, Madrid, Amsterdam. Never mind New York. This is sad, and a great loss to our visual culture. Across numerous interested blogs and sites (hopefully increasingly including this one), a dispersed collection of recordings of such signage is amassing. As well as copyrighted but beautiful collections like that of Martin Eastman, the likes of Jack Schulze are working on potentially 'open' versions of public lettering collections. It'll be interesting to see if we can figure out a way of locating and denoting these dispersed signage collections, to at least recreate a sense of what we're missing from our streets. This isn't simple nostalgia, or conservatism for the sake of it. 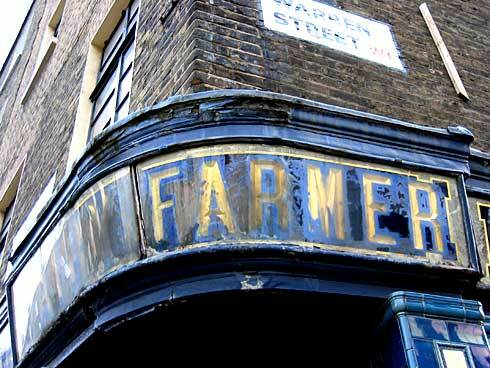 It may be a dying trade and skill - literally (RIP Sam Lee) - but at the very least we can keep its memory alive online, in the hope that our cities recapture the progressive spirit behind such signs once again. First in an occasional series looking at the kind of 'information architecture' people do everyday. The series isn't intended to imply that there isn't complexity and professionalism in the field of IA (quite the opposite!) but to simply highlight some of the local, personal design and information architecture practices people employ in everyday life - further evidence of adaptive design (following the work of Moran and Strickland.) These are symbolic exercises in ordering life and structuring environment, but not carried out by professionals - personal responses to problem-solving. Vernacular information architecture? 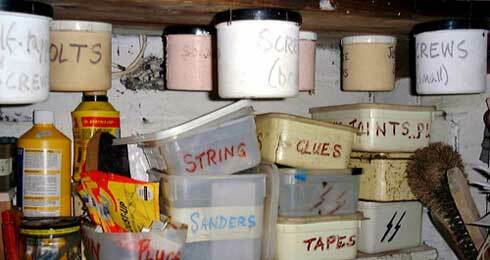 This is my Dad's garage, source of fascination and wonder when I was a kid. 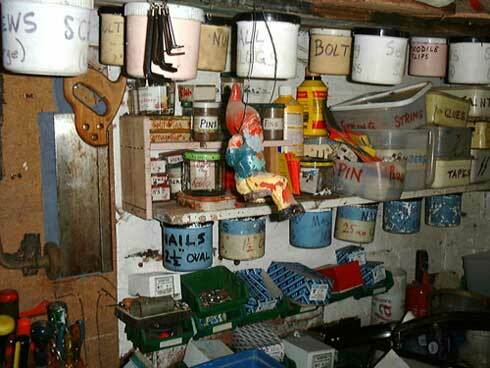 Fascinating due to the screw-filled jamjars, their lids stuck to the underside of shelves, labelled in permanent marker; ice cream tubs stacked high with various gauges of bolt, nut, and screw (spot the 'icon' for electrical components); the wall-mounted tool rack, with drawn outlines of tools, or painted 'shadows', indicating where to put them back. It all looked chaotic at first glance (and still does at second glance!) but upon looking closer, it contained carefully refined strategies for ordering his everyday life. Personal design solutions, organising the 'at-hand'. "White space, graphic windows, new logo, basic and utilitarian, selected colour ... These are the elements that have influenced our design and product development over the past twelve months." She's big in Japan, not surprisingly. Her clothes adapt, beautifully. "A lot of fashion seems to have that throwaway quality about it. We have to appreciate fashion, but my pieces are more like applied arts. It's like designing a chair: I want something that will stick around ... It's not going to be chucked out after six months," she says. "It wears in, becomes something you love. It's about the life of the fabric." Design dissolving in behaviour? Addendum: Her store on London's Wigmore Street is perhaps that city's finest, in my opinion, with exemplary service, beautifully recessive interiors and a fantastic range of both clothes and furniture, as well as integrating regular exhibitions. I've been extremely impressed with the Oyster user experience thus far. I travel on tube or bus in London relatively infrequently and variably - I walk to work, so it's really only random journeys from Broadcasting House to Bush House, and then a regular once a week to play football in Kennington Park. That's it, apart from ad hoc journeys at weekends. Nowhere near enough to justify buying a travelcard, so the new pre-pay Oyster card is ideal - it's more convenient than fumbling for change, and it's cheaper (journeys are at 2003 prices). It was easy to obtain (fill in a form, take it to the local tube), and I've just recharged the card online at the excellent Oyster website. The login process was simple (unique ID printed on card), the shopping cart relatively straightforward and essentially 'good pattern'-based, and the website design - being clean, simple, professional and modern - inspired confidence and quickly began to engender trust. Don't know who's behind it, but good job. I know this sounds like an advert (and am aware of concerns about tracking journeys), but due to the size, complexity, and lack of coordination within London, I'd pretty much lost all hope of the city's transport infrastructure being significantly improved. Yet Oyster is really very very impressive, and part of a suite of massive improvements by Transport For London/Mayor of London in the last couple of years (alongside new buses & tubes, better signage, the congestion charge etc. - albeit a potential minus with the bus ticket machines). So, still work to do but nice one, Ken + team.